Take a sneak peek into this teenager’s bedroom and you’ll see the plans for taking over the world. No, he’s not some super-villain who dreams of ruling with an iron fist. Instead, Todd James dreamed of spreading his art throughout the world. Also known as REAS, he is now an internationally recognized artist who started his career as a child in the New York subway system. It was a long way from the underground to the fine art galleries, MTV shows and the album covers of some major music stars, but James finally conquered the world. The elaborate and colorful plans he made as a youngster now serve as a reminder that dreams really do come true, if you give it your best. Todd James was born in New York where he began his career as a child in the NY City subway system. In his early childhood, Todd’s friends introduced him to writing and, one day, they wrote in one of the staircases of their building. He felt guilty about it and even told his mom! Luckily, she just said: OK well just don’t do that again. A few years later, when Todd was in eighth grade, he changed school and met some guys who invited him to do trains. Todd went along and soon he found himself tagging NY trains under the name REAS. And, that is how it started. Todd recalls Saturday morning cartoons as his very first artistic influence; cartoons such as Ralph Bakshi’s Spiderman, H.R. Pufnstuf, and the Japanese monster movies like Godzilla and Gamera – have woken up the artist within. Later on, the inspiration and influences just kept coming – Bakshi, Vaughn Bode, R. Crumb, Frazetta, Jack Kirby, Tack, FBA, the Cream Wheels of Fire album cover… As a fully matured artist, Todd showed a variety of influences, like pop culture as well as American expressionist painters such as Willem de Kooning and Franz Kline. Today, Todd James is internationally recognized artist shown at numerous museums and galleries worldwide. While many would expect a shock in a transition from the streets into a gallery space, Todd managed and continued to stay authentic to the genesis of his creative endeavors. His work lingers between fine and commercial art, with forays into costume design, large-scale installation and work within the music, fashion and TV industry. 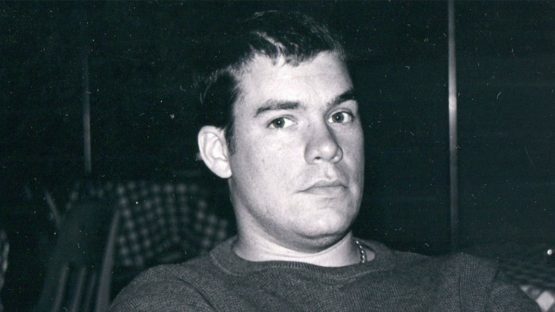 James has designed in 1987 the Beastie Boys’ Brooklyn Dust Elephant logo, The Source Magazine logo; he worked with Mobb Deep, Red Man, Eminem and Kid Rock. Todd created a coloring book/zine Attitude Dancer and its art was used as a cover for Iggy Pop‘s album Beat em up. Also, Todd used to be the puppet designer for Crank Yankers on Comedy Central produced by Jimmy Kimmel and Jack Hole productions. With a combination of elements, both abstract and surreal, a characteristic of all of his work is an existence of fine line between the profane and the humorous – Todd thinks there is some humor in everything that surrounds us, and that people simply take away things from art the creator maybe never even intended. One of his most popular characters is definitely “warrior princess”. A sorcery women and swords were big in Todd’s youth culture and are inspired by Frank Frazetta and Vaughn Bode (underground cartoonists and illustrators) and all the sci-fi fantasy book covers from the ‘70s, as well as Dungeons and Dragons. “Those cartoons were very underground and offered up something more real than what was coming out of Disney. Heavy Metal Magazine and Conan books as well as the game Dungeons and Dragons were big. So making these are sort of looking back and having a second childhood. I’m ordering Conan novels and Wizard hats off of E-bay but I draw the line at replica swords.” The infantilized Western culture and all of its fallout are derided by this master of modern-day satire. Today, when war is literally Disney-fied, as James Todd says, he adds grinning faces to machines of destruction; blonde airheads enjoy a comically sensual existence, East African Islamist bandits bask in a pastel paradise… What James aims is to break the distance between an imposed ignorance and an innate curiosity in all audiences, by seducing the viewer with a seamless mix of luminous compositions and graffiti-infused erotica. 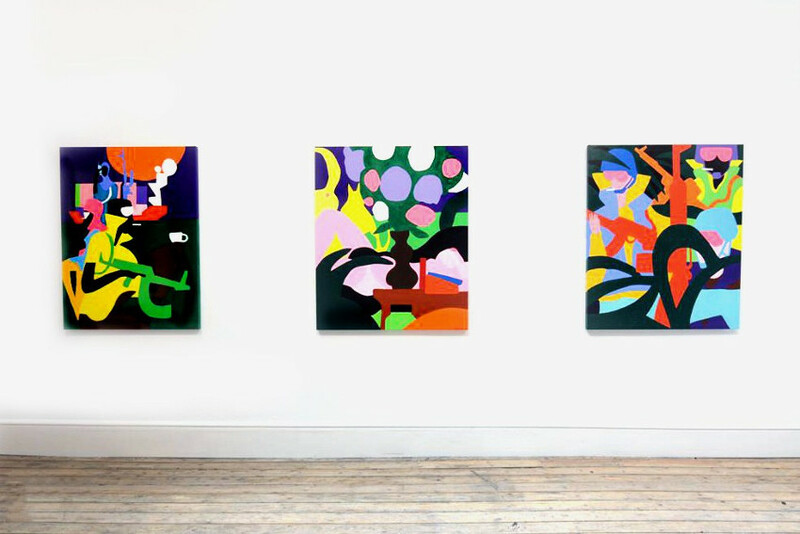 In 2015, Todd James presented at London’s Lazarides Rathbone a vivid body of hyper-colored works titled Fantasy Island – a nod to the 70’s television show of the same name, where Mr Roarke made everyone’s dreams come true. The large-scale paintings depict a fantastical reality far away from the safety of Western existence. Fantasy Island explores the grotesque of socio-political news: modern-day Somali pirates, UN soldiers, and scantily-clad females, adorned with AK47s and over-sized sunglasses. In parallel to the exhibition, Todd James has also transformed a vintage Chevrolet van, outside the gallery doors, expanding on childhood references first curated in his Vandal’s Bedroom – an homage to the environment Todd James grew up with and in part informed his later practice. The Vandal’s Bedroom was first premiered as part of the Art in the Streets exhibition at the MOCA in Los Angeles. 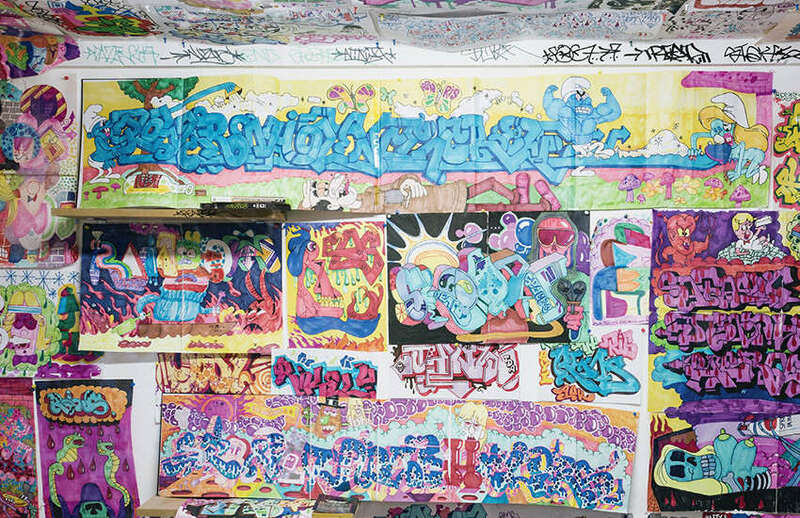 This installation mimics a teenage graffiti vandals bedroom and working headquarter, with hundreds of rough sketches pinned roughly to the walls, pop culture references, slogans, appropriated cartoon characters and art supplies. From cartoons, warrior princesses, Beastie Boys and Eminem, Miley Cyrus twerking bears, from the streets to the fine art galleries, it’s been a long way for James Todd, and guess what – his journey is far from over. We can only wonder what is his next ‘scheme’ for ruling the world, and we certainly hope it would be as successful as his previous attempts. He has managed to bridge that gap between street and fine art, and in doing so, he has enriched his artworks with influences from the both sides. Today, there is no contemporary artist that matches the youthful insight of Todd James. He is represented by We Art Partners and Lazarides. Todd James lives and works in New York. Featured image credits Sandra Gering Inc.